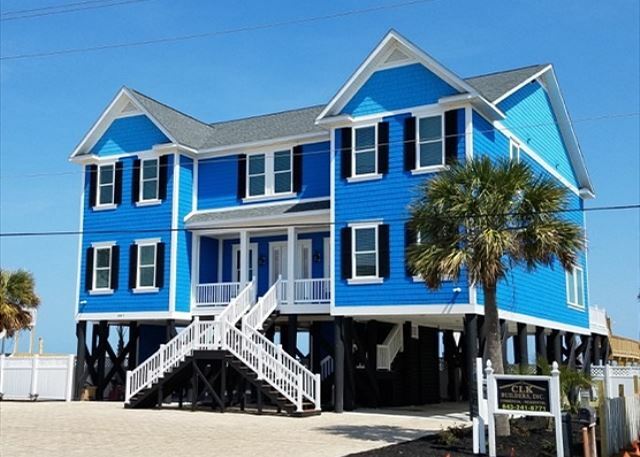 Brand New Construction for 2017, Professionally Maintained Private Pool & Kiddie Pool, Private Walkway to Beach, Oceanfront Covered Porch 1st & 2nd Levels, Rocking Chairs, Picnic Tables, Gas Grill, Paved Parking, Professionally Landscaped Grounds, Non Smoking, No Pets Allowed. This house lives up to it's name! This house is so close to the ocean! It's location is second to none. Shore was perfect..plan to stay again. A couple of things we noticed not enough dish towels and need more waste baskets in the kitchen and through out the house. Beach/pool was great!!! Access to both were great. Plenty of room. Would like to have used the elevator on the day we moved in. Lot of groceries and luggage carried up stairs. We enjoyed our brief stay here because of Hurricane Florence! The house is beautiful and the pool is amazing! The kitchen is huge which we enjoy but really needs more cooking supplies. Also some of the bathrooms only had one towel hook,not a towel bar a hook for one towel.And not able to use the elevator at least to unload and load left some unhappy campers.The location is perfect with only steps to the beach! Overall it was a great place! Great experience. The house was clean and spacious. The common rooms were large and open. The pool was very large with a great deck area and numerous lounge chairs. Porches were covered and furnished with rockers - great way to begin the morning and end the day - staring out at the ocean. We enjoyed it so much that we signed up for the same house nest season. Our group consisted of 5 families from Northern New York for a total of 23 house-guests! We all had a wonderful time and the weather was perfect! The accommodations were immaculate and spacious. The beach area was perfect and we didn't have to share the space with others. We were happy to see the homeowners chose to include a grill on the property along with 4 full sized refrigerators! The pool area was beautiful with plenty of chairs and space for all. We brought corn hole, volleyball, Kan Jam and other outdoor games with us and there was plenty of space for it all. Ample parking and lots of sleeping area for everyone to have their own space. We appreciate the professionalism from Beach Realty and are looking forward to another stay next year! Perfect house for a large family. Love the kids room. Everything was perfect! We had 17 family members and we totally enjoyed our stay. The seven children had a blast in the great pool and beach. The home is wonderful through out! Whoever designed, choose the colors, and decorated should be very pleased with the result. It is the perfect design, perfect paint, floors, cabinets, ...just everything is PERFECT! Of all the beach homes we have stayed in, this one is the BEST! Thanks for sharing your home with us! This house was great. We had 3 families sharing the home. The kitchen is very spacious, there are 4 refrigerators, 2 ice machines, 2 dish washers and is fully stocked with dishes, silverware, pans, etc. The pool was awesome. We had it heated and at times it was like a hot tub. The rocking chairs on the deck and porch were a very nice added touch. The pool table and chess/checkers game was used often. We would love to return. The girls at Beach Reality were great! Thank you for a wonderful vacation to one of our favorite spots on earth - Murrells Inlet!